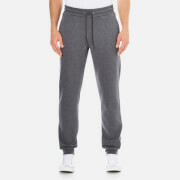 Men’s grey cuffed track pants from the Versace Gym Collection. Crafted from soft cotton blend jersey, the slim cut sweatpants feature a two side pockets and a rear patch pocket with a signature embroidered medusa logo. Complete with ribbed cuffs and a drawstring elasticated waistband with metal details. 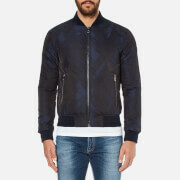 85% Cotton, 5% Polyester, 5% Viscose, 5% Nylon Made in Italy Model is 185cm/6'1 and wears a size M.
Men’s two-tone blouson jacket from Versace Collection. The bomber jacket comprises a zip through fastening, classic bomber collar and long sleeves. Featuring two zipped pockets to the side and a plain back yoke, the blouson is complete with ribbed trims, rubber Medusa branding to the sleeve and an all-over print. 100% Polyamide Made in Italy Model is 188cm/6'2 and wears a size EU 48. 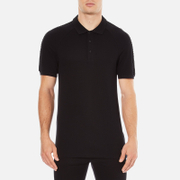 Black cotton polo shirt from Versace Collection. Crafted from soft piqué cotton, the classic polo comprises a ribbed knit collar, three button placket and cuffed short sleeves. Featuring embossed trim detailing to the shoulders and complete with a signature silver-toned Medusa emblem to the side hem. 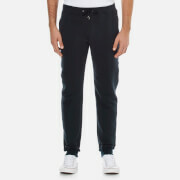 100% Cotton Model is 185cm/6'1 and wears a size L.
Navy sweatpants from Versace Collection. The trousers comprise an elasticated waistband with a drawstring fastening and banded ankle cuffs. The classic joggers are complete with two side pockets and a rear pocket tonally embroidered with the signature Versace Collection Medusa logo. Model is 188cm/6'2 and wears a size M.
Men's zipped hoody from Versace. Cut from pure cotton with a regular fit, the hooded jacket features an integrated hood with adjustable drawstrings, a centre zip fastening and two pockets to the hips. Complete with ribbed trims and embroidered half Medusa motif to the chest. 100% Cotton. 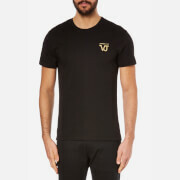 Model is 184cm/6'0.5 and wears a size M.
Men’s black cotton T-shirt from Versace Jeans. Constructed from premium cotton, the tee features classic traits including a ribbed knit crew neckline, short sleeves and a straight hem. Finished with a gold foil logo to the chest. 100% Cotton Model is 188cm/6'2 and wears a size M.
Men’s white cotton shirt from Versace Jeans. Crafted from crisp cotton, the shirt features a chest pocket with a ‘VJ’ metal logo, a contrast black top button and a pointed collar. Complete with a curved hem and button cuffs. 100% Cotton Model is 185cm/6'1 and wears a size M.
Black cotton polo shirt from Versace Jeans. 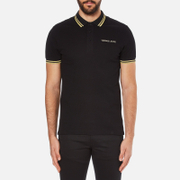 Constructed from piqué cotton, the polo comprises a classic ribbed knit collar and cuffed short sleeves with contrast metallic tipping details. 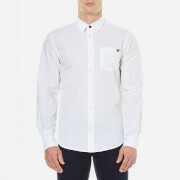 Featuring a three button placket and Versace Jeans lettering to the chest. Complete with large embroidered emblem to the rear. 100% Cotton Model is 188cm/6'2 and wears a size M/IT 48. 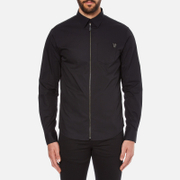 Black long sleeve cotton shirt with zip placket from Versace Jeans. An updated twist on the classic style, the shirt is crafted from soft pure cotton and comprises a point collar, button cuffed sleeves and a full front zip fastening. Cut with a curved hem for a flattering fit and featuring a tonal chest pocket. Complete with a silver-toned ‘V’ emblem. 100% Cotton Model is 188cm/6'2 and wears a size M/IT 48. 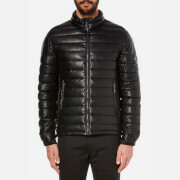 Men’s black down jacket from Versace Jeans. Made from a textured matte fabric, the padded coat comprises a high collar, long cuffed sleeves and a full zip fastening. Featuring side zipped pockets and finished with the label’s signature emblem to the sleeve. 100% Polyester Model is 188cm/6'2 and wears a size M.
Danish label VILA's 'Sari' Printed Kimono is constructed with a thin, soft material and an all-over contrasting floral pattern. 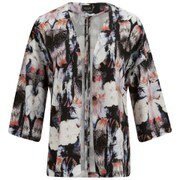 Featuring three-quarter sleeves, dropped shoulders and an open front. Cuts a loose fit. E.N. 96% Polyester, 4% Elastane.